Currently, the word Integral, and the Integral Movement, is defined almost totally within a Wilberian context. The problem is that this means either intellectual and organisational conservatism, with "Integral" becoming a sort of New Paradigm religion, lacking in spiritual insight (gnosis), or a generic association of Wilberian or Post-Wilberian themes. However, the original definition of the word was not by Ken Wilber, but by Sri Aurobindo. In this essay, I suggest a solution; definition of Integral that includes all current definitions. This posits five dimensions: Religious, Theoretical, Practical, Enlightened, and Divinised. In as much as the Practical is itself divided into three - Collective, Participatory, and Individual - this makes seven or eight aspects altogether. It is suggested that only by taking all these aspects into account can we have a complete definition of Integral. Dear Alan Kazlev, your "suggestion" contains several category errors, rather typical for early attempts at synthesis. Also, bashing Wilber (e.g. "Wilberitis"??? give yourself a break) won't help either. I find the article interesting, but I would say that you might be barking up the wrong tree here. Maybe Wilber says (as I think he does) that Integral is true but partial? He admits its only a map and asks us to not get caught up in the map. SO i ask you alan (and others) do we even NEED to define such things, or is living 'it, i, we' more about, well, praxis? ps- I do think Wilberitis should be DSM-IV material... I know many who have it, or who have had it! So if there are errors in his article, what are they and how so? Making claims based on you devotion to Ken is no real claim at all. OLD COMMENTS by Frank Visser"
Since the use of the label "integral" has caught on like wildfire in recent years, resulting in an Integral Institute, Integral Psychology, Integral Research, Integral Developent, Spiral Dynamics Integral, Integral Coaching, etcetera, etcetera, it's high time to focus on this key concept. Who can come up with more meanings of "integral"? -the integration of different theories within a field - cf. 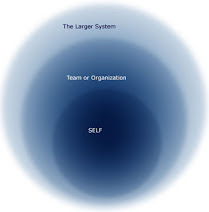 integral psychology, where does every school of thought fit in? - and to save the best for last: the integration of all of the above ! 1) This item might need some explanation. By definition, human development is a twin process of differentiation and (hierarchic) integration -- meaning: the emergence of something new, and the rearrangement of the psyche under this new element. Without the concept of differentiation, the idea of integration can easily be misunderstood. Without differentiation, integration is just the integration of "what is". Integration by itelf does not discover new levels or realms. Only by differentiation we transcend "what is". After every step of differentiation, integration is called for, but it is never a goal in itself. Hi everyone. Thanks for your comments and feedback! Hokai, read my essay more carefully. You'll see that I distinguish between Wilber, who is a theorist (the second category) and his naively religious followers. btw it's a point in the Wilberians' favour that they came up with the term Wilberitis themselves; as long as there is humour, things will work out ok! Flexgurl, yes, Wilber does see himself as a mapmaker. The problem is that people take his maps too seriously, and it seems he himself can get pretty defensive about them too! Certainly, his version of Integral is partial, and as you say he himself acknowledges that. But once you go beyond mental limitations you attain an integral, or an esoteric, insight that embraces all perspectives, all truths, all realities. The partiality only comes from the way this insight is then translated and restricted by the mental faculty of the surface being. I agree with you completely on the importance of practice. Absolutely, that's what it's all about. You also ask, do we even need to make definitions here? My reply: if we don't, then Integral either becomes a synonym for Wilberism, or a meaningless buzz-word. Theory and Practice complement each other; each without the other is one-sided and limited. The anonymous person who posted Frank's comments: Yes I read them and was intrigued by them some years back. Frank was certainly ahead of his time in posting them! But the problem is, these sort of definitions (i.e. integral as the integration of a differnetiated reality) are still only based on Wilber's way of thinking. Read Sri Aurobindo's Synthesis of Yoga or Jean Gebser's The Ever-Present Origin for completely different insights and definitions of "integral". Interestingly, New Age holism says basically the same thing as Wilberian Integral and the mainstream Integral movement do (see for example Wouter Hanegraaff's excellent book on the New Age movement for a good overview). So in what way does the worldview and practice of the Integral movement differ from the New Age movement? Or is it just a subset of the latter? Is there even an Integral movement as such apart from Wilber and his followers and critics? These are all topics worth discussing. I have to confess I do not understand how people can get so fascinated with Wilber. As for a truly holistic philosophy it should ideally be virtually free of personal opinion (such as an obvious bias towards Aurobindo,Sant Mat, Mahikari,Wilber,Kabbalism, Wicca et cetera). It should be like a massive, or rather an infinite jigsaw puzzle in which all the pieces (ie philosophies of one sort, or another) should fit together into a Whole. But, such a jigsaw can by its very nature never be complete. The reason is simple, and already indicated. It is INFINITE. The Truth is infinite. In many respects, your seeming quest for an integral philosophy of sorts is like Multi-Dimensional Science (or Hypothesis rather)on your informative, and intriguing website. It too is INFINITE, and there are so many aspects to it which have yet to be revealed.. Though politics is not your field you should try to cultivate some interest in it in spite of its appalling reputation. It is important that basic human rights continue to be largely upheld in the rich countries to ensure that research like yours, and mine will ofcourse continue to flourish in this world. As the famous saying goes "..the price of freedom is eternal vigilance." What is needed is an "integral"political philosophy which is holistic per se (ofcourse, this is already happening to a certain extent). The term I used for it is Positive Human Politics, or PHP.It should show humanity the many existing options for social, economic, and political change. Let us also hope your book(s) will be published soon. * Multi-Dimensional Science, or MDS (also referred to as the Multi-Dimensional Hypothesis) if true could be the greatest "scientific" invention in history. It offers for the first time a methodology in which we can objectively understand how non-physical spiritual, and psychic phenomena could be proved (albeit indirectly),and hence, how this could work for the advancement of humanity. Searle believes that ideas, and mathematics similiar to modern physics do have a huge relevance in the research, and development of MDS even though some of the findings may be partly, or wholly ineffable. Moreover,he has suggested that some non-physical phenomena could be "accurately" described, and made "provable" by using semiotic,or symbolic type coding when it comes to mystical ascents into "higher worlds". It is hoped that a book will result entitled The Multi-Dimensional Hypothesis; The New Psychic, and Spiritual Paradigm. This project will take longer than TFE. A degree in physics will be unnecessary as its basic thesis can be created, and explained by anyone. However, those with an academic background in the sciences, and to some extent in the arts will be necessary to forward the research, and development of this new "science," or hypothesis. An Association for Multi-Dimensional Science (AMS) may be set up. Furthermore, Searle is creating a worldwide directory of well-known, and more importantly little known esoteric societies whose mystical, and psychic knowledge may prove invaluable for the theoretical dimension of MDS. This project when completed, and published will probably be the most comprehensive ever produced. Simple codes may be used to reduce the amount of information given per entry of this projected directory. Of course, top academics around the globe should be researching, and developing MDS, and TFE but this is not the case because these evolving subjects are too advanced, and radical for most of them. They both represent a quantum leap in human understanding. Robert Searle hopes to self-publish two other directories. These deal with business opportunities, and ideas plus one on nutritional health, and healing. They would be sold via mail order, and/or the internet. He is concerned among other things about setting up businesses to fund his two research, and development projects of MDS, and TFE. Anon, it's good that you don't! I don't want to have some sort of religion around myself, like what has happened with Ken. It's better that everyone creatively develops their own ideas. and why define something that is much more than its label? It's precisely because the mainstream conception of Integral is either so limited (AQAL religion) or so vague and amorphous (generic New Age/New Paradigm) that some sort of definition is needed. Not to be believed in uncritically, but to help get the discussion going, and to broaden the scope of things beyond colour-coded theorising, elitist self-promotion (2nd tier ingroup etc), and trying to read the whole of human knowledge and spirituality through a Wilberian lens. I have my own occult explanation of how politics works, which is bound to be controversial as it is totally outside the mainstream secular agnostic consensus worldview! And the trouble with politics (I'm not even going into the above-mentioned esoteric/occult aspect here) is that it is always based on lust for power, deceitfulness, and appeal to the lowest common denominator. The beauty of an integral worldview is that it accepts every view as contextually appropriate but partial - temporarily suited for the conditions to which it corresponds while including and anticipating what comes next in our unfolding emergence. The argument is shifted from narrow, partial right/wrong choices to what appropriately serves the whole. We also recognize the shadow side of globalization - the growing gaps between rich and poor, expansion of crime on a global level, drug cartels and, of course, global terrorism. We regard these endemic problems as the result of people being stuck in developmental stages, unable to move on because their needs are not being met at the particular levels where they are, thereby creating toxic behavior on both individual and collective levels. We believe that conflict has more to do with diverse deep core values than surface manifestations such as race, ethnicity or religion. I also think that the notion of divinization is unclear..
Why go beyond when everything already is.. I got a very good vibe reading what you had posted from Kosmos journal, and also from the Kosmos website itself. From your site it seems like a very worthy project; part of the global awakening, the great turning Macy, Korten), the global mindshift (Swimme). And I get the impression reading what you posted here that you have taken only the best of the Wilberian worldview, and none of that claustrophobic literalism that characterises Ken's more enthusiastic followers (I mean, they're really great people, I don't want to knock them, but it's just that attachment to dogmatism that I cannot find any agreement or compatability with). So basically, apart from maybe a few hair-splitting quibbles, I have no disagreement with anything you have written, just the opposite. I like the practical orientation as well. And what I am trying to do is add to these dimensions of theory and social transformation the further dimensions of individual and collective spirtual transformation. Rather than diminish the current theory and current praxis, this will only enhance it, add a whole new dimesnion to things, which is non-contradictory and synergetic. In the past, spirituality was a reclusive practice that involved the rejection and denial of the world, and activism was all about changing the world but not changing the self (with the result that the revolution, began in the service of justice and freedom, always goes sour and becomes a totalitarian regime). The Integral movement presnets the possibility of healing this rift in a higher synthesis; indeed, it is already beginning to do so. So I am interested in an integral spirituality and integral yoga that transforms the world, and adds to the essential contributions of those working on an activist, social, media, etc level to improve the world, additional dimensions of insight, tranquility, wisdom, and centeredness. My essay is not about going "beyond" integral but about helping to create a more complete definition and experience of Integral. For a more complete clarification of "divinisation", see the last four chapters of Sri Aurobindo's The Life Divine (or if that's a hassle, just the last two chapters alone), and also Saprem's Mind of the Cells (however I don't agree with Satprem's misinterpretation of pop Darwinian ideas (biological evolution), which I think are not applicable to this subject) I also have some comments on my website that I wrote years ago. Also some comments in my essay on Frank Visser's site here, where I contrast the old Wilberian-Daist-Advaito-Buddhist position of transcdenet Liberation with the radical Integral Yoga perspective of transformation of this world. But really it is hard to summarise something like this in a few words. For the most part it is unfamiliar to both western secular materialism and religious literalism, and to the non-dualist Eastern spiritualities that inspired both Transpersonal Psychology and (from there) much of Wilberian Intgralism. I'm not saying the old spiritualities are wrong, or should be denegrated, only that they do not provide a path for the spiritual transformation of this world. I am intrigued at the posibility of the modern Integral movment in helping with the propagation of this new spirituality. After all, Sri Aurobindo, not Wilber, was the one who gave integral spirituality to the world. And even the mainstream integral movment it is after all, about the integration and transcendence of opposites, which is also what Integral Yoga is about (beyond materialisma nd other-worldly spirituality). I hope we can begin to reinvent “Integral” as something much MORE about actualization of the reality to which "integral" might refer... non? Ah. Well, my own practice of Integral is based on spiritual transformation (integral yoga). I'm not saying it has to be this for everyone, not at all, but for me, Integral practice means integral spiritual transformation. Everything else flows from there. And this practice culminates in divinsiation of this world, because that is what is the most real, the most complete, inclusive, radical, and the most integral, for me. "So I am interested in an integral spirituality and integral yoga that transforms the world, and adds to the essential contributions of those working on an activist, social, media, etc level to improve the world..."
I'm a musician/composer and I've had a music blog for years but recently started working on a new project that explores an integral perspective on creative music. Stop by when you have a chance, I mentioned your essay in my last post. I am quite aligned with what Kazlev is saying about the term, and concept of, "Integral" needing to be more inclusive than just KW's "version". I think that goes for anyone's version, including Aurobindo's. 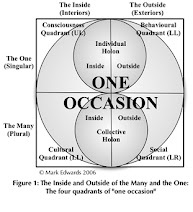 It seems to me no one has a corner on the "right" or "whole" definition or understanding since we're all always some "degree" of partial in our grasp of what the whole reality/truth-as-Integral IS (and, it's my sense, if/when we do open into ONEness, as such, there's not much interest in "talking about" integral). That said, I do think that it's important for all of us to be putting into the group-mix our own understandings and articulations of our experiences of what "Integral" is or means. And I can't help but think that this is a conversation that will go on for eternity, given the nature of Integral reality and the continually evolving nature of consciousness (our capacities and abilities to apprehend and verbalize our experiences and such). Probably the biggest mistake any of us can ever make is to decide on one "final" definition of "Integral". Of course, for practical purposes we'll usually agree on a working definition for stretches of time, until we get a "better" one. (Since I didn't read the second half of the above comments, I apologize if I'm redundant with mine). Alan, I like some of what you write here, but why so esoteric? Isn't integral about expanded worldviews, and not "defining" things down to a bottom line? Integral is as integral does right? Kris: your blog looks great! Very interesting exploration of integral and music. I posted a comment. Joseph: I'm not defining things down to the bottom line, just providing an alternative to Wilber. If there are no alternatives, then the integral movement defaults to Wilberism, simply because KW has appropriated and popularised the term. Sure, he can use Sri Aurobindo's and Jean Gebser's original term to define his own philosophy, but I can also use it with equal if not greater justification to define a more encompassing perspective! That's what I'm doing here, breaking the monopoly, and hopefully stirring up debate. "Without offering a close reading of Wilber's relevant texts, Kazlev's screed sheds less light than he thinks it does. And given the bombast of his anti-Wilber rhetoric, it will probably do little to encourage the mainstream Integral movement to take up the study of Aurobindo. I find much value in Kazlev's serious attention to the Aurobindian tradition. It would be a terrible shame if serious students of Integral were put off study of this wise and valuable tradition because they encountered a presentation which regarded others in the IM with such a demeaning and derogatory framework."